You might be surprised to learn that I collect a few things <pause for laugh track>. Actually, I collect waaaay too much stuff, but I’ve become pretty good at narrowing my focus, and when I open my museum to the public, it will surely spark some serious nostalgia in anyone who enjoys pop culture. 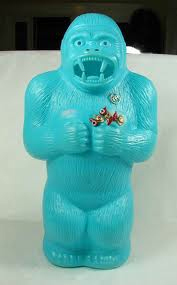 I have been tempted by this Marx windup gorilla many times, but it has always been more expensive than I was willing to spend. I would have to have the original box, which sends the price to $500 or more–way more than I would ever spend on a toy. Of course, if I had one of these, I’d probably wear out the windup mechanism on the first day! I have three of these large A.J. Renzi banks, but they also made these in bright blue and lime green that I have never been able to track down. There was a blue one on eBay for a while, but it was poked full of holes so I didn’t buy it. One of these days, I’m going to stumble across one of these in a box at a flea market and a few tears may be shed. This is the latest post in response to the weekly blog challenge presented by the League of Extraordinary Bloggers. This week’s topic asked what is your holy grail and what else do you collect? 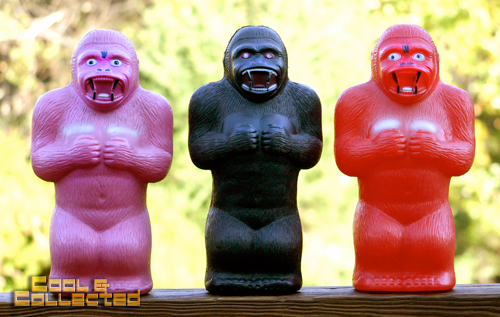 Do you have any of the Planet of the Apes Megos? I always thought those looked pretty awesome. I have four of the Mego figures. Those are actually the only Mego figures I own! My friend had one of those banks (not your grail one) bursting at the seams with pennies years ago. Very cool. Awesome read Brian. I’ll keep my eyes open for those banks when I hit up the flea markets here in NYC.